The most common therapeutic procedure performed by a Doctor of Chiropractic is known as “spinal manipulation,” also called “chiropractic adjustment.” The purpose of manipulation is to restore joint mobility by manually applying a controlled force into joints that have become hypomobile – or restricted in their movement – as a result of a tissue injury. Tissue injury can be caused by a single traumatic event, such as improper lifting of a heavy object, or through repetitive stresses, such as sitting in an awkward position with poor spinal posture for an extended period of time. In either case, injured tissues undergo physical and chemical changes that can cause inflammation, pain, and diminished function for the sufferer. Manipulation, or adjustment of the affected joint and tissues, restores mobility, thereby alleviating pain and muscle tightness, and allowing tissues to heal. 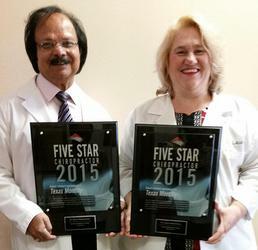 In fact, Dr. Shuvir and Dr. Lauren were nominated and received the FIVE Star Award for the Highest Level of Service and Satisfaction by our patients which was published in the March 2015 Issue of Texas Monthly Magazine.